This is one meal I firmly believe every home cook should have in their repertoire…a meal that you’ve got in your back pocket, ready to pull out and make at any time. I would bet that if you’ve even got a halfway decently stocked pantry, you’ll have everything you need to make this recipe. 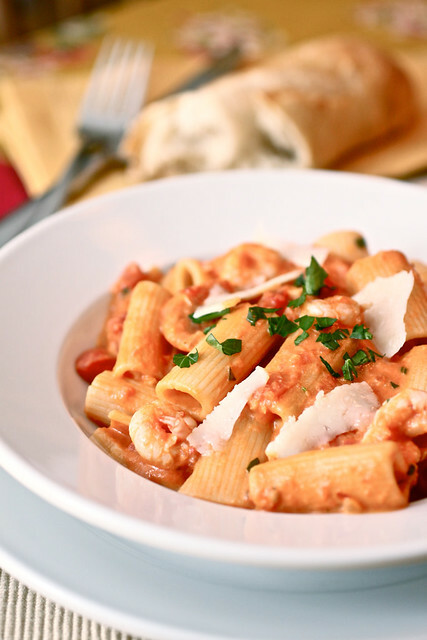 Since penne alla vodka is usually the only dish I order at our favorite local Italian restaurant, I decided it was time to find a great recipe to add to my repertoire so that on the nights when I’m craving it, it’s only a few steps away from my table. And since today is Valentine’s Day, I thought it would be a great meal to post, especially since it’s pink but more importantly, this is for those of you who haven’t decided on what to make yet or who are on the fence about going out to dinner. In my opinion, dinner in a restaurant on Valentine’s Day a waste of your hard-earned moula and I can guarantee that this meal will be better than what you’ll get in a restaurant tonight. This was by far, the best vodka sauce I’ve made at home, and every bit as excellent as at our favorite restaurant. Hit up the grocery store on the way home from work this afternoon if you don’t have what you need in the house already. Throw on a pot of boiling water, cut up a small onion and some garlic, measure out (or don’t measure if you’re feeling frisky) your vodka and some heavy cream, follow the quick recipe, maybe add a salad and some crusty bread and you’ve got this fantastic meal on the table in less than 30 minutes. Now that’s a weeknight meal I can appreciate…and it’s one that’s special enough for a holiday like this one or to serve to guests. I threw some shrimp into the sauce before I added the heavy cream to let them cook through but you can add diced rotisserie or grilled chicken or even quickly sautéed scallops if you want to make the meal extra special. The meal itself is pretty versatile and if you don’t have or don’t want to use heavy cream, use half-n-half or milk. I forgot to buy basil this week so I used some fresh parsley instead. 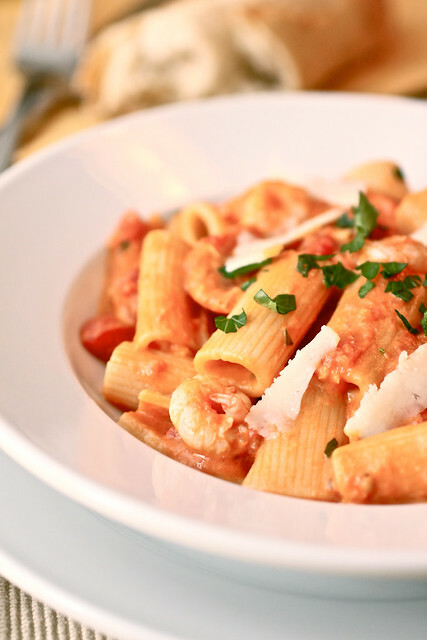 Use whatever kind of pasta you have on hand – I like rigatoni with this sauce but rotini, penne, ziti, etc. all work just as well. I feel like the red pepper flakes should be optional – if you like spice, add 1/4 – 1/2 tsp and if you don’t want the spice, I don’t think the dish will suffer without the heat. The recipe calls for a 280z can of whole tomatoes, half of which you puree, the other half of which you dice. However, it would just be easier to buy a 14oz can of pureed or crushed tomatoes and a 14oz can of diced tomatoes – why break out the food processor for such a simple meal? The recipe posted below is as originally written but feel free to make whatever changes you feel necessary to make it your own…and to make it one that you can truly pull out of your back pocket when you’re in a pinch for a great meal. Enjoy! Heat the oil in a large saucepan over medium heat until shimmering. Add the onion and tomato paste and cook, stirring occasionally, until the onions are light golden around the edges, about 3 minutes. Add the garlic and pepper flakes; cook, stirring constantly, until fragrant, about 30 seconds. Meanwhile, bring 4 quarts water to a boil in a large stockpot over high heat. Add 1 tablespoon Kosher salt and the pasta. Cook until just shy of al dente, then drain the pasta. Add the pasta to the sauce and toss over medium heat until the pasta absorbs some of the sauce, 1 to 2 minutes, adding reserved pasta water if sauce is too thick. Stir in the basil and adjust the seasoning with salt. Divide among pasta bowls and serve immediately. This has been a favorite of ours for a few years now; in fact, I just made it on Saturday! I agree, it’s so nice to have a simple, yet elegant meal that you can manage to make easily during the week. Great recipe to have up your sleeve- such a classic! I love it! It turned out so beautiful-and the addition of the shrimp? What a fabulous idea! This is a great meal. It is important to have a great go-to meal ready to put on the table fast. This looks really lovely. And a great pantry dinner too! YUM! Made this for dinner tonight and it was really good and very simple to throw together! I did go ahead and use 14oz each of diced and crushed tomatoes instead of dealing with the whole tomatoes and that worked really nicely! Great classic dish, easy and tasty! Thanks for sharing the recipe!